Geckoes are in the front rank of the bands on the English Ceilidh scene. Evolving out of the country dances of the British Isles, Europe and America, this style of dancing is typified by its exuberance and Geckoes' music has all the energy and style that it takes to fill a floor with hundreds of delighted - if somewhat sweaty - dancers. Geckoes are a favourite attraction at dance clubs such as Haddenham and Oxfolk, and have for many years been regular performers at major folk festivals including Sidmouth, Towersey, Broadstairs, Chippenham, and Whitby. If your booking requires a smaller, more flexible band than the full Geckoes line-up, Chameleons could be just the thing for you. A selection of YouTube videos is available, including a couple from the 2012 Broadstairs Folk Festival, featuring new member Matt Quinn. 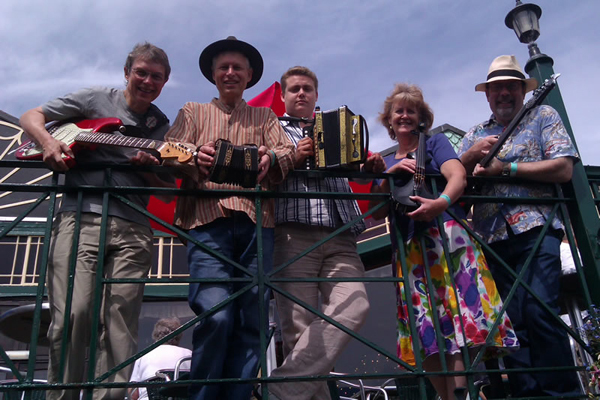 Dave Parry, Geckoes' melodeon-player, succumbed to cancer in March 2012. We've gathered together some of the obituaries and tributes which he inspired.